Admiral Graf Maximilian von Spee-commanding the German squadron of two armoured cruisers, SMS Scharnhorst and Gneisenau, the light cruisers SMS Nx�rnberg, Dresden and Leipzig, and three auxiliaries-attempted to raid the British supply base at Stanley on the Falkland Isles. A larger British squadron- consisting of the battlecruisers HMS Invincible and Inflexible, the armoured cruisers HMS Carnarvon, Cornwall and Kent, and the light cruisers HMS Bristol and Glasgow-had arrived in the port only the day before. Visibility was at its maximum, the sea was placid with a gentle breeze from the north west, the sun bright, the sky clear. The advance cruisers of the German squadron had been detected early on, and by nine o'clock that morning the British battlecruisers and cruisers were in hot pursuit of the five German vessels, these having taken flight in line abreast to the south-east. All except Dresden and the auxiliary Seydlitz were hunted down and sunk. The British battlecruisers each mounted eight 12 in (300 mm) guns, whereas Spee's SMS Scharnhorst and Gneisenau each had eight 8.24 in (209 mm) guns. Additionally, the battlecruisers could make 25.5 kn (29.3 mph; 47.2 km/h) against Spee's 22.5 kn (25.9 mph; 41.7 km/h); thus, the British battlecruisers could both outrun their opponents and significantly outgun them. An obsolete pre-dreadnought battleship-HMS Canopus-had also been grounded at Stanley to give a stable gunnery platform and act as a makeshift fortress for the defence of the area. Following von Spee's success on 1 November 1914 at the Battle of Coronel, off the coast of Valparaiso, Chile, where his German East Asia Squadron sank the cruisers HMS Good Hope (Admiral Cradock's flagship) and Monmouth, von Spee's force put into Valparax�so. As required under international law for belligerent ships in neutral countries, the ships left within 24 hours, moving to Mas Afuera, 400 mi (350 nmi; 640 km) off the Chilean coast. There they received news of the loss of the cruiser SMS Emden, which had previously detached from the squadron and had been raiding in the Indian Ocean. They also learned of the fall of the German colony at Tsingtao in China, which had been their home port. On 15 November, the squadron moved to Bahia San Quintin on the Chilean coast, where a ceremony was held to distribute 300 Iron Crosses second class, amongst the crew, and an Iron Cross first class to Admiral Spee. Spee was recommended to return to Germany if he could. His ships had used � their ammunition-which could not be replaced-at Coronel, and had difficulties obtaining coal. Intelligence reports suggested that the British ships Defence, Cornwall and Carnarvon were stationed in the river Plate, and that there had been no British warships at Stanley when recently visited by a steamer. Spee had been concerned about reports of a British battleship, Canopus, but its location was unknown. On 26 November, the squadron set sail for Cape Horn, which was reached on 1 December, then anchored at Picton Island, where they stayed for three days distributing coal from a captured British freighter, and hunting. On 6 December, Spee proposed to raid the Falkland Islands before turning north. The raid was unnecessary because the squadron already had as much coal as they could carry and was opposed by most of Spee's captains, but he decided to proceed. On 30 October, retired Admiral of the Fleet Sir John Fisher was reappointed First Sea Lord to replace Admiral Prince Louis of Battenberg, who had been forced to resign because of public outcry against a perceived German prince running the British navy. On 3 November, Fisher was advised that Spee had been sighted off Valparaiso and acted to reinforce Cradock by ordering HMS Defence, already sent to patrol the eastern coast of South America, to reinforce his squadron. On 4 November, news of the defeat at Coronel arrived. As a result, battlecruisers HMS Invincible and Inflexible were ordered to leave the Grand Fleet and sail to Plymouth for overhaul and preparation for service abroad. Chief of Staff at the Admiralty was Vice-Admiral Doveton Sturdee. Fisher had a long-standing disagreement with Sturdee, who had been one of those calling for his earlier dismissal as First Sea Lord in 1911, so he took the opportunity to appoint Sturdee Commander in Chief, South Atlantic and Pacific, to command the new squadron from Invincible. On 11 November, Invincible and Inflexible left Devonport, although repairs to Invincible were incomplete and she sailed with workmen still aboard. Despite the urgency of the situation and their maximum speed of around 25 kn (29 mph; 46 km/h), the ships travelled at a steady 10 kn (12 mph; 19 km/h); running at high speed used significantly more coal, so to complete the long journey it was necessary to travel at the most economic speed. The two ships were also heavily loaded with supplies. Although secrecy of the mission was considered important so as to surprise Spee, on 17 November Lieutenant Hirst from Glasgow heard locals discussing the forthcoming arrival of the ships while ashore at Cape Verde; however the news did not reach Spee. Sturdee arrived at the Abrolhos Rocks on 26 November, where Rear Admiral Stoddart awaited him with the remainder of the squadron. Sturdee announced his intention to depart for the Falkland Islands on 29 November. From there, the fast light cruisers Glasgow and Bristol would patrol seeking Spee, summoning reinforcements if they found him. Captain Luce of Glasgow, who had been at the battle of Coronel, objected that there was no need to wait so long and persuaded Sturdee to depart a day early. 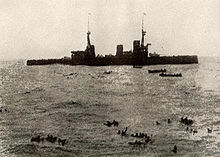 The squadron was delayed during the journey for 12 hours when a cable towing targets for practice firing became wrapped around one of Invincible's propellers, but the ships arrived on the morning of 7 December. The two light cruisers moored in the inner part of Stanley Harbour, while the larger ships remained in the deeper outer harbour of Port William. Divers set about removing the cable wrapped around Invincible's propeller. Cornwall extinguished her boiler fires to make repairs, and Bristol dismantled one of her engines. The famous ship SS Great Britain-reduced to a coal bunker-supplied coal to Invincible and Inflexible. The armed merchant cruiser Macedonia was ordered to patrol the harbour, while Kent maintained steam in her boilers, ready to replace Macedonia the next day, 8 December. Spee's fleet arrived the morning of the 8th. Picture - The Battle of the Falkland Islands. Spee's cruisers-Gneisenau and Nx�rnberg-approached Stanley first. At the time, the entire British fleet was coaling. Some believe that, had Spee pressed the attack, Sturdee's ships would have been easy targets, although this is a subject of conjecture and some controversy. Any British ship that tried to leave would have faced the full firepower of the German ships; having a vessel sunk might also have blocked the rest of the British squadron inside the harbour. Fortunately for the British, the Germans were surprised by gunfire from an unexpected source: Canopus, which had been grounded as a guardship and was behind a hill. This was enough to check the Germans' advance. The sight of the distinctive tripod masts of the British battlecruisers confirmed that they were facing a better-equipped enemy. Kent was already making way out of the harbour and had been ordered to pursue Spee's ships. To Spee, with his crew battle-weary and his ships out-gunned, the outcome seemed inevitable. Realising his danger too late-and having missed the golden opportunity to shell Sturdee's fleet while in port-Spee and his squadron dashed for the open sea. The British left port around 10:00. Spee was ahead by 15 mi (13 nmi; 24 km) but there was a lot of daylight left for the faster battlecruisers to catch up. It was 13:00 when the British battlecruisers opened fire, but it took them half an hour to get the range of the Leipzig. Realising that he could not hope to outrun the fast British ships, Spee decided to engage them with his armoured cruisers alone, to give the light cruisers a chance to escape. They turned to fight just after 13:20. The German armoured cruisers had the advantage of being to windward of a freshening north-west breeze, causing the funnel smoke of the British to obscure their target practically throughout the action. Author Hans Pochhammer indicates that there was a long respite for the Germans during the early stages of the battle, as the British attempted unsuccessfully to force Admiral Spee away from his advantageous position. Despite initial success by Scharnhorst and Gneisenau in striking Invincible, the British capital ships suffered little damage, thanks to their heavier armour. Spee then turned to escape, but the battlecruisers came within extreme firing range 40 minutes later. Invincible and Inflexible engaged Scharnhorst and Gneisenau, while Sturdee detached his cruisers to chase Leipzig and Nx�rnberg. Inflexible and Invincible turned to fire broadsides at the armoured cruisers and Spee responded by trying to close the range. His flagship Scharnhorst took extensive damage with funnels flattened, fires and a list. The list became worse at 16:04, and she sank by 16:17. Gneisenau continued to fire and evade until 17:15, by which time her ammunition had been exhausted, and her crew allowed her to sink at 18:02. During her death throes, Admiral Sturdee continued to engage Gneisenau with his two battlecruisers and the cruiser Carnarvon, rather than detaching one of the battlecruisers to hunt down the escaping Dresden. 190 of Gneisenau's crew were rescued from the water. The battlecruisers had received about 40 hits, with one man killed and four injured. Meanwhile, Nx�rnberg and Leipzig had run from the British cruisers. Nx�rnberg was running at full speed but in need of maintenance, while the crew of the pursuing Kent were pushing her boilers and engines to the limit. Nurnberg finally turned to battle at 17:30. Kent had the advantage in shell weight and armour. Nurnberg suffered two boiler explosions around 18:30, giving the advantage in speed and manoeuvrability to Kent. She then rolled over at 19:27 after a long chase. Cruisers Glasgow and Cornwall had chased down Leipzig; Glasgow closed to finish Leipzig which had run out of ammunition but was still flying her battle ensign. Leipzig fired two flares, so Glasgow ceased fire. At 21:23, more than 80 mi (70 nmi; 130 km) southeast of the Falklands, she rolled over, leaving only 18 survivors. Ten British sailors were killed during the battle and 19 wounded; none of the British ships were badly damaged. 1,871 German sailors were killed in the encounter, including Admiral Spee and his two sons. A further 215 survivors were rescued and ended up prisoners on the British ships. Most of them were from the Gneisenau, five from Nx�rnberg and 18 from Leipzig. Only seven of the 765 officers and men survived from Scharnhorst. Of the known German force of eight ships, two escaped: the auxiliary Seydlitz and the light cruiser Dresden, which roamed at large for a further three months before her captain was cornered by a British squadron off the Juan Fernx�ndez Islands on 14 March 1915. After fighting a short battle, Dresden's captain evacuated his ship and scuttled her by detonating the main ammunition magazine. 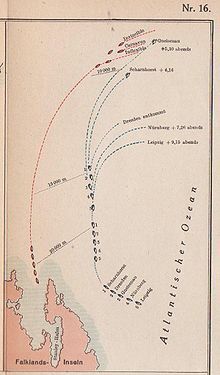 After the disaster, German naval experts were baffled at why Admiral Spee attacked the base and how the two squadrons could have met so coincidentally in so many thousands miles of open waters. Kaiser William II's handwritten note on the official report of the battle reads: "It remains a mystery what made Spee attack the Falkland Islands. See 'Mahan's Naval Strategy'." It is generally believed that Spee was mislead by the German admiralty into attacking the Falklands. He called a meeting of his officers and announced that he would attack the base which acted as a coaling station and wireless relay station for the British, as his intelligence, received from the German wireless station at Valparaiso, reported the port to be free of Royal Navy warships. Despite the objection of three of his ships' captains, the attack proceeded. However, 1925 the German naval officer, Franz von Rintelen, interviewed Admiral William Reginald Hall, Director of the Admiralty's Naval Intelligence Division (NID), and was informed that the Spee Squadron had been lured towards the British battlecruisers squadron by means of a fake signal sent in a German naval code broken by British cryptographers. (Similarly, on 14th March 1915, the Dresden, was intercepted by British ships while taking on coal at sea in a location identified by NID codebreakers). Massie, Robert K. (2004). Castles of Steel: Britain, Germany, and the Winning of the Great War at Sea. London: Jonathan Cape. ISBN 0224040928. Irving, John (1927). Coronel and the falklands. London: A. M. Philpot, ltd..